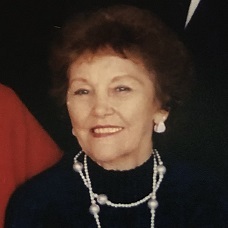 Annie Mae Tucker, 96, of Dyersburg, Tennessee died on Tuesday, March 19, 2019, at her residence in Dyersburg,Tennessee. Born Sunday, May 28, 1922, in Parsons, Tennessee. She was the daughter of the late Will Holland and the late Mae Belle Holland. She was a loving home-maker and Nanny. Funeral services will be 1:00 PM, Thursday, March 21, 2019, in the Chapel of Johnson-Williams Funeral Home. Officiating this service will be Mr. Brent Pearce. Interment will follow in Dyer County Memorial Gardens in Dyersburg, Tennessee. Visitation will be Thursday, March 21, 2019, from 11:00 AM until 1:00 PM at Johnson-Williams Funeral Home. She is survived by two daughters, Wanda Akers of Valparaiso, Indiana, Linda Longmire of Dyersburg, Tennessee; sixteen grandchildren; twenty six great-grandchildren and Numerous great-great-grandchildren. In addition to her parents she was preceded in death by one daughter Edna Stoneburner; one son, Jackie Suratt; two sisters, Syble Dickens and Jewel Holland and one brother, Paul Holland. Pallbearers will be Derek Patterson, Tra Allen, Dennis Bledsoe, Anthony Bradford, Jaylynn Bradford and Eunice Mack. Online condolences may be made to the family at johnsonwilliamsfuneralhome.com. Johnson-Williams Funeral Home is honored to serve the family of Annie Mae Tucker.